Give back and warm your tummies and your heart with a bowl (or bowls!) of some scrumptious soup, rolls are served and beverages are available. Musical entertainment is provided all afternoon by the fabulous musicians of the Elora Acoustic Cafe! All of the proceeds go toward the fight against hunger and poverty in our community. This is the Signature Event of the Sensational Elora Festival and our Empty Bowls/Empty Glasses Project. On this day a number of chefs, both amateur and professional, will face off by creating their best soup using as many local ingredients as possible. What a great way to give back on this special Day of Thanks! Entry to soup-off is only $15.00 for adults, $5.00 for children under 12 and $35.00 maximum for a family of two adults plus children. There will also be a dazzling display of one-of-a-kind bowls and glasses, donated by local artists and available for only $25.00. Every dollar spent goes directly to a worthy cause. Be generous! Voting will take place during the event and prizes will be awarded. For more information and an application form to take part in the Soup-Off competition please visit our contest page. Youth - Landyn Meadows / Congratulations on winning with your Roasted Squash soup. 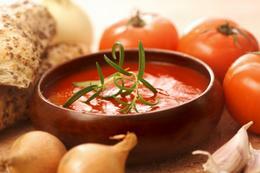 Professional - Thomas Radcliffe - Hoppy Field Farms / Congratulations on winning with your Tomato soup. Amateur - Dianne Ballantyne/ Congratulations on winning with your Leek/Spinach Cream soup.